French Revolution | ADULT CATECHESIS & CHRISTIAN RELIGIOUS LITERACY IN THE ROMAN CATHOLIC TRADITION: hosting ONLY True Christians!! !, or "How to think Catholic!!" “First, there are the many martyrs who, in the Diocese of Angers , in the time of the French Revolution, accepted death because they wanted to, in the words of William Repin, “keep their faith and religion “firmly attached to the Roman Catholic Church; priests, they refused to take an oath considered schismatic, they would not abandon their pastoral care; laity, they remained faithful to the priests at the Mass celebrated by them, the signs of their worship to Mary and the saints. True Christians, they also evidenced by their refusal to hate their tormentors, for their pardon their desire for peace for all: “I have asked the Good Lord for the peace and unity of all” (Marie Cassin) . Finally, their last moments show the depth of their faith. Some sing hymns and psalms to the place of execution; “They ask few minutes to make to God the sacrifice of their lives, they did so fervently that their torturers themselves were astonished.” Sister Marie-Anne, Daughter of Charity, comforts and his sister, “We’ll have the joy of seeing God and possessing Him for all eternity … and we will be owned without fear of being separated” (testimony of Abbot Gruget). 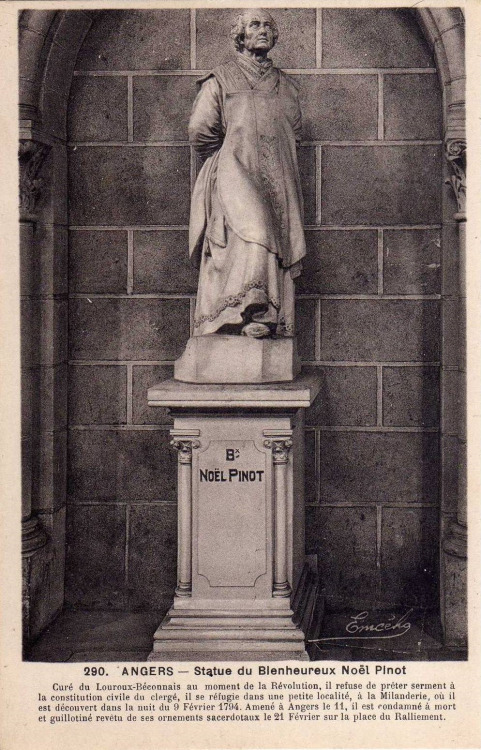 Blessed Noel Pinot, priest & martyr (feast February 21), Noel was born at Angers in 1747. He became a priest and excelled in ministering to the sick. In 1788, he was made pastor at a parish in Louroux Beconnais, which he revitalized spiritually through his piety and preaching. Father Noel refused to take the oath of allegiance to the new French Republic which denied the authority of the Church, and was sentenced to be deprived of his parish for two years. Nonetheless, he continued to carry out his ministry in secret. Later, the holy priest even took clandestine possession of his parish and continued his pastoral work, managing to avoid capture for his defiance of the Revolutionary edict. However, one day while fully vested for Mass, Father Noel was captured and dragged through the streets to the jeers of hostile spectators and soldiers. He remained in jail for twelve days and was given the death sentence for refusing to take the oath. 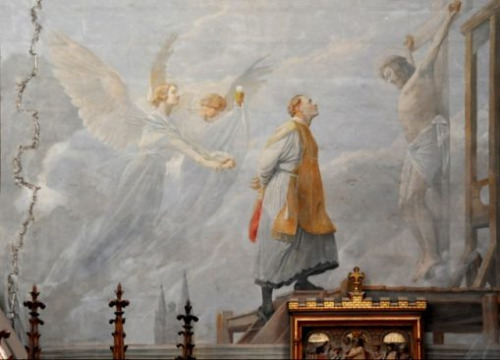 The holy priest went to the guillotine still vested for Mass and uttering the words that began the pre-Vatican II Mass: “I will go to the altar of God, to God Who gives joy to my youth.” He joined his sacrifice to that of his Master on February 21, 1794, and was beatified in 1926. Blessed Renee-Marie Feillatreau was born in Angers, France, in 1751. A wife and mother, she was accused of being involved with Catholic “brigands,” of encouraging non-conformist priests, robbing the Republic by hiding sacred vestments and vessels, and of shouting, “Long live religion! Long live the King!” Her guilt actually lay in her devotion to her Catholic faith. Renee-Marie declared before her judges that she would rather die than renounce her faith, and that she did indeed visit and protect priests of the Roman Catholic Church and had attended their Masses. 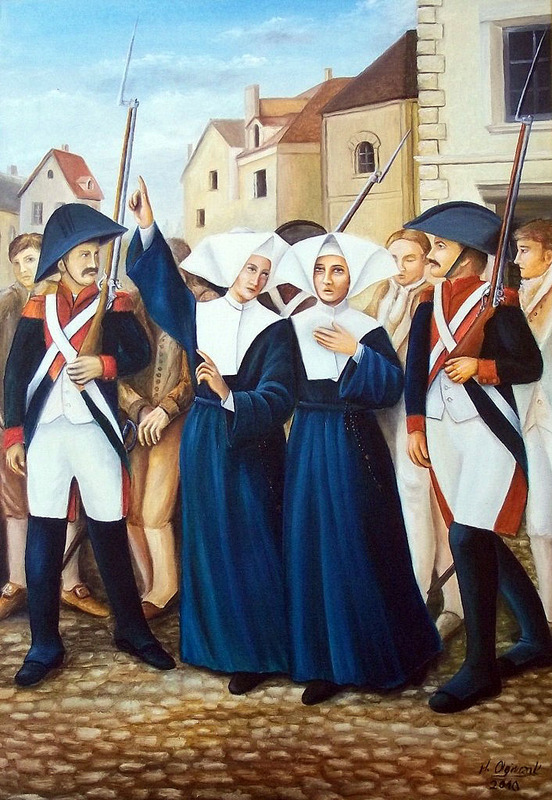 Blessed Renee-Marie Feillatreau was guillotined on March 28, 1794, and beatified in 1984. The hospital of Saint-Jean was one of the oldest hospitals in France, founded in 1175 by Henri Plantagenet, Count of Anjou and King of England, to expiate for the murder of Thomas Becket. By the seventeenth century it needed restructuring, as the mayor, aldermen, and townspeople attested. 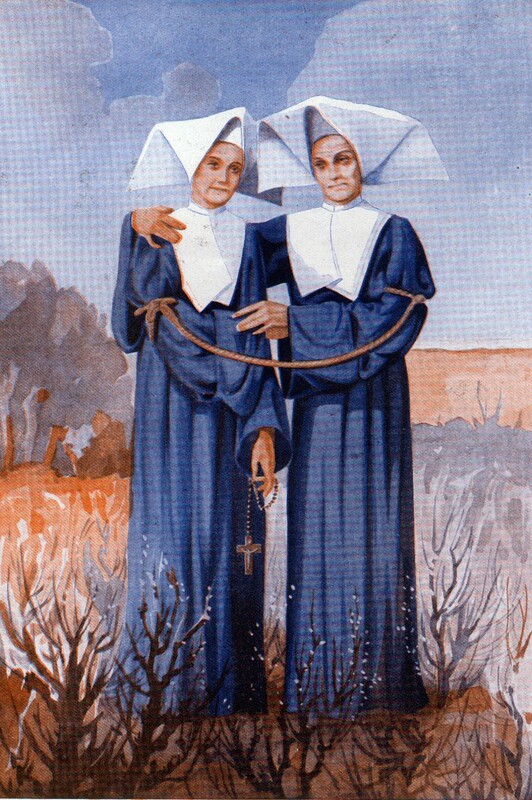 The Bishop of Angers, Claude de Rueil, and the Abbe de Vaux, addressed themselves to Saint Vincent de Paul with the request for the Daughters of Charity. In December 1639 Saint Louise de Marillac herself brought there the first Daughters of Charity, the first to leave the environs of Paris and the Motherhouse. The contract between the Company of the Daughters of Charity and the administrators of the hospital was signed February 1, 1640. In 1790 the revolutionary Assembly in France ordered the confiscation of all religious property and on July 12, 1790 promulgated the Civil Constitution of the Clergy which made the clergy functionaries of the state and the Church a national church. 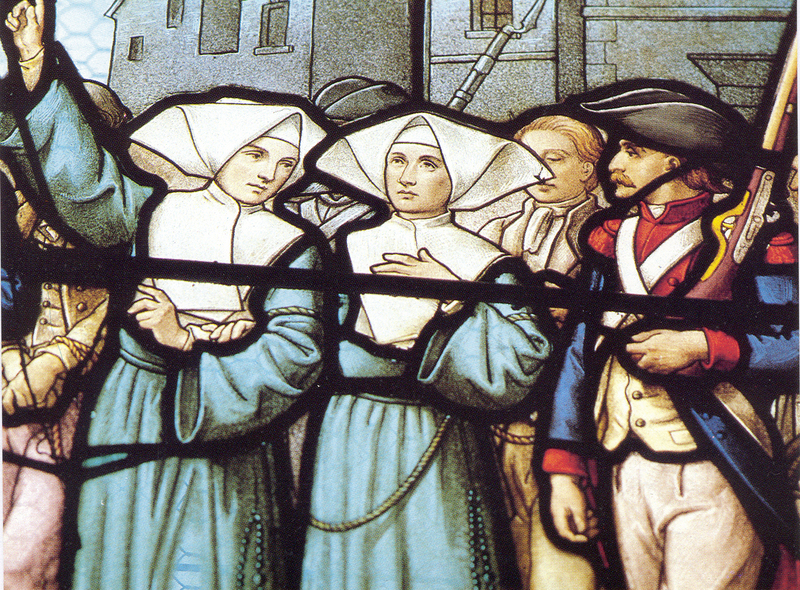 On September 2, 1793, local revolutionaries were annoyed to hear that the Sisters were still working peacefully at the hospital of Saint-Jean. A petition was sent to the municipality: at all cost, and as soon as possible, the Sisters must be made to take the oath and shed their habit. The Sisters replied that the oath was meant only for public ofﬁce holders; that their sole function was to look after the sick; that up to this time they had not disturbed public order; that, for these reasons, they considered themselves dispensed from all oaths, and that they would not take any. Yet, some weeks later the sisters were made to change their habits. From Sister Marie-Anne’s own words, on the day of her interrogation: the sacriﬁce of the holy habit was one of the most painful of her life. 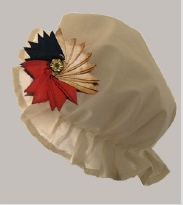 On their new headdress the Sisters had to wear the national cockade, which had been made obligatory for women by law. Notre Père qui êtes aux cieux, que votre nom soit sanctifié, que votre règne arrive, que votre volonté soit faite sur la terre comme au ciel. Donnez nous aujourd’hui notre pain quotidien; pardonnez nous nos offenses comme nous pardonnons à ceux qui nous ont offensés; et ne nous laissez pas succomber à la tentation; mais délivrez nous du mal. Ainsi soit-il. Je crois en Dieu, le Père tout puissant, Créateur du ciel et de la terre, et en Jésus-Christ son fils unique, Notre-Seigneur, qui a été conçu du Saint Esprit, est né de la Vierge Marie, a souffert sous Ponce Pilate, a été crucifié, est mort, a été enseveli; est descendu aux enfers; le troisième jour, est ressucité des morts, est monté aux cieux, est assis à la droite de Dieu le Père tout-puissant, d’où il viendra juger les vivants et les morts. Merci, Le Sacré Coeur de Jésus! 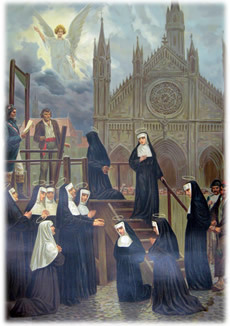 A group of eleven nuns of the Ursuline Order who were arrested by authorities of the French revolutionary government and guillotined between October 17 and 23, 1794, at Valenciennes. Their crime: they reopened a school in contravention to the government decree prohibiting unapproved educational institutions from functioning. The nuns were: Sr Clotilde Paillot, OSU, superior; Sr Marie Louise Ducret, OSU; Sr Marie Magdalen Desjardin, OSU; Sr Marie Louise Vanot, OSU; Sr Françoise Lacroix, OSU; Sr Margaret Leroux, OSU; Sr Anne Marie Erraux, OSU; Sr Anne Joseph Leroux, OSU; Sr Gabrielle Bourla, OSU; Sr Jane Louis Barré, OSU; and Sr Jane Rievie Prin, OSU. The prioress, Sr Clotilde Paillot, OSU, tried to take the entire blame on herself for any illegal actions but the tribunal refused to agree and all were condemned to the guillotine. Sr Marie Erraux, OSU was utterly terrified and Sr Clotilde comforted and supported her, promising to stay close beside her. Valenciennes is within the boundary of France but very close to the border of the Austrian Netherlands (present day Belgium). The Revolutionary government closed a larger number of religious houses and schools, including that of the Ursulines. Their property seized and confiscated, evicted, the Ursulines moved across the border to Mons in the Netherlands, where another Ursuline monastery gave them shelter. In 1793 Austria invaded northern France to vindicate its sovereignty over the Austrian Netherlands. In doing so it also seized a strip of French territory that included Valenciennes. The evicted nuns therefore returned to Valenciennes, now Austrian, and reopened their school. But the French retaliated and recaptured Valenciennes. What were the poor nuns to do now? They decided to continue with their school in their old home. Shortly thereafter, the French government arrested and jailed the Ursulines of Valenciennes. On what charge? That they were emigrees who had returned to France without permission and were illegally conducting a religious school! Five of them were brought to trial on October 17, 1794. They stated frankly that they had returned to teach the Catholic religion. For this crime they were condemned to death by the anti-Christian French authorities. Five days later the same superior, Sr Marie Clotilde Paillot, OSU, and the other five nuns were condemned to die in the same manner. Mother Paillot made the public declaration, “We die for the faith of the Catholic, Apostolic Roman Church!” This time the victims were transported to the guillotine in a tumbril or dump-cart. Now, the commissioners had overlooked a lay sister of the community, Cordule Barre. Cordule would not be separated from her sisters. Hurrying over to the cart, she climbed in of her own accord, and was executed with the rest. As they moved on to the scaffold, all six sang the Litany of Our Lady. What do Catholic martyrs do facing their immanent death? They sing! 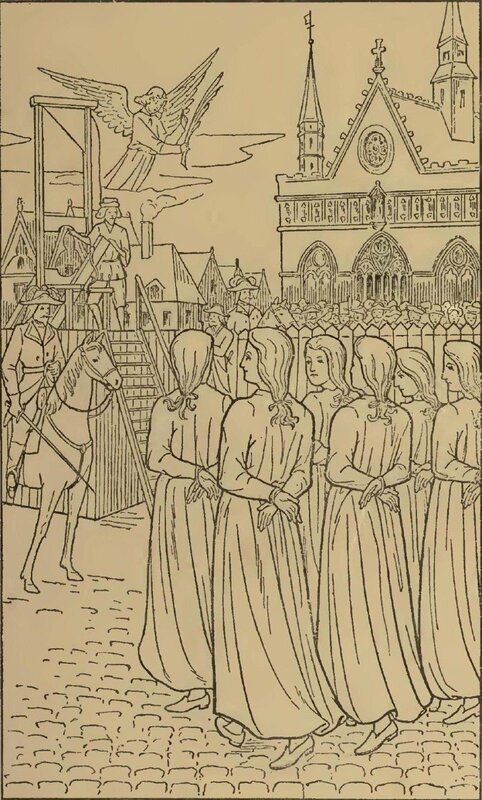 -“Les onze Ursulines de Valciennes” the execution of eleven Ursuline nuns on 17.and 23.10.1794, by commissar Jean-Baptiste Lacoste following Robespierre’s Reign of Terror, wood engraving, 1921, from: Almanac du Pelerin de 1921 Maison de la bonne Press, Paris. No. 3997. God the Son, Redeemer of the word, have mercy on us. Queen of the Church, pray for us. Lamb of God, You take away the sins of the world; spare us O Lord! 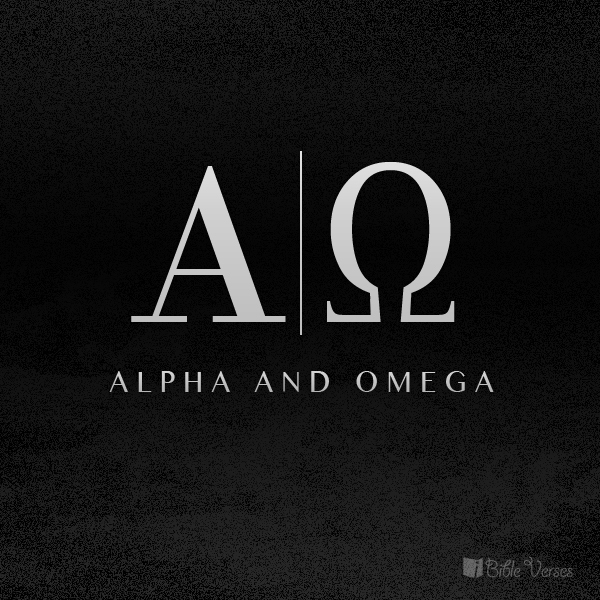 Lamb of God, You take away the sins of the world; graciously hear us, O Lord! At these killings the crowd was usually out for entertainment jeering and shouting insults and making a great noise. But as the sisters were led to the guillotine the crowd fell utterly silent and still. Sr Clotilde thanked the soldiers, calling it the most beautiful day of their lives. They were not allowed any religious symbols, but she had hidden a crucifix on her person, and when she reached the guillotine, she threw it out into the crowd. Two hundred years later, at a service commemorating the bicentenary of their death, the family of Sr Clotilde brought this crucifix to the Ursulines and asked them to keep it in the convent chapel at Valenciennes in memory of the martyred sisters. “For with authority and power He commands the unclean spirits, and they come out” (Luke 4:36). Jesus stupefies the people of Capernaum in the Gospel today by the authority with which He speaks, an authority that even drives out demons by a simple command. It’s interesting to consider that the response of the people to Jesus’ authority was one of wonder and respect. It’s questionable whether He would get the same response today. Our reaction to authority is often one of opposition. The reluctance to accept authority has long been embedded deep in man’s soul. However, in the last few hundred years with the advent of liberalism and its stress on individual autonomy, this reluctance has come to be embraced by society at large as something good. A cruel and bloody manifestation of this occurred on this day in 1792 in Paris when over 200 Catholic priests were executed in the course of the September Massacres of the French Revolution. While there are not any executions of clergy going on in the West today, people, even many of those professing to be Catholic, still ignore the authority of the teachings of Christ’s Church. All things participate in His existence. He is the source of all and has made each thing, including human nature, according to some plan or idea that He has of that thing. “In wisdom you have made them all,” the Psalm 104:24 says. God has instilled a marvelous order in creation, and He knows every one of His creatures better and more intimately than we know ourselves. Just as an ENGINEER 🙂 can explain how to use a design of his in a way that will achieve the purpose for which he made it, so in a far more magnificent way, God explains to man through the teaching of the Church how to achieve the purpose for which man is made – everlasting happiness with God in heaven. 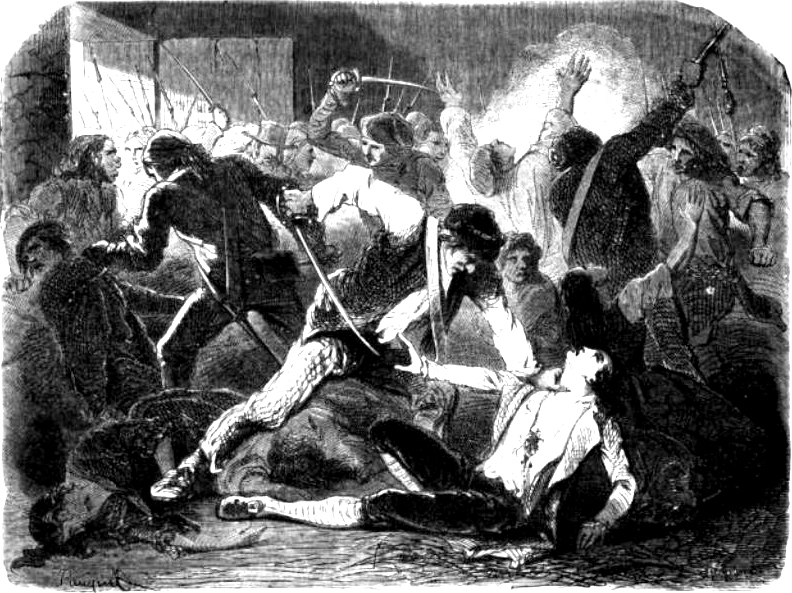 -massacre at the Salpetriere , September 3, 1792. Practically every page in the history of the French Revolution is stained with blood. 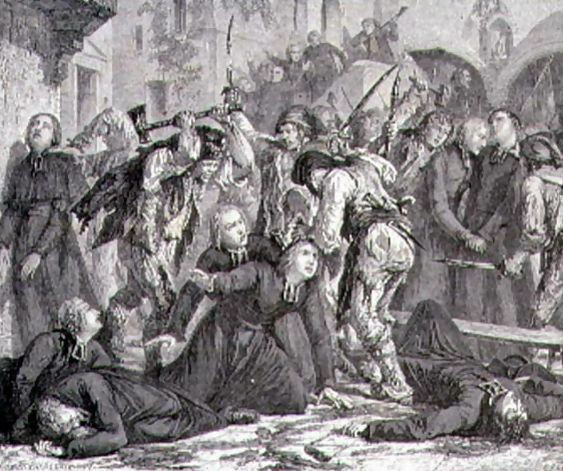 What is known in history as the Carmelite Massacre of 1792, added nearly 200 victims to this noble company of martyrs. They were all priests, secular and religious, who refused to take the schismatic oath, and had been imprisoned in the church attached to the Carmelite monastery in Paris. Among these priests were a Conventual, a Capuchin, and a member of the Third Order Regular. These priests were victims of the French Revolution. Though their martyrdom spans a period of several years, they stand together in the Church’s memory because they all gave their lives for the same principle. The Civil Constitution of the Clergy (1791) required all priests to take an oath which amounted to a denial of the faith. Each of these men refused and was executed. John Francis Burte was born in the town of Rambervillers in Lorraine. At the age of 16 he joined the Franciscans at Nancy and there he also pronounced his solemn vows. In due time he was ordained a priest and for some time taught theology to the younger members of the order. He was at one time also superior of his convent. After Pope Clement XIV, formerly a Conventual friar, had ordered the merging of the province of the Franciscans, to which John Francis belonged, with the Conventuals, Father John Francis was placed in charge of the large convent in Paris and encouraged his brethren to practice strict observance of the rule. His zeal for souls was outstanding, and he zealously guarded the rights of the Church in this troubled period of history. When the French Revolution broke out, he was reported for permitting his priests to exercise their functions after they refused to take the infamous oath required by the government, and which was a virtual denial of their Faith. He was arrested and held captive with other priests in the convent of the Carmelites. His constancy in refusing to take the sacrilegious oath won for him a cruel martyrdom on September 2, 1792. Acquiring a reputation as an excellent preacher, confessor and instructor of clerics, Apollinaris of Posat was preparing to go East as a missionary. He was in Paris studying Oriental languages when the French Revolution began. Refusing the oath, he was swiftly arrested and detained in the Carmelite convent. 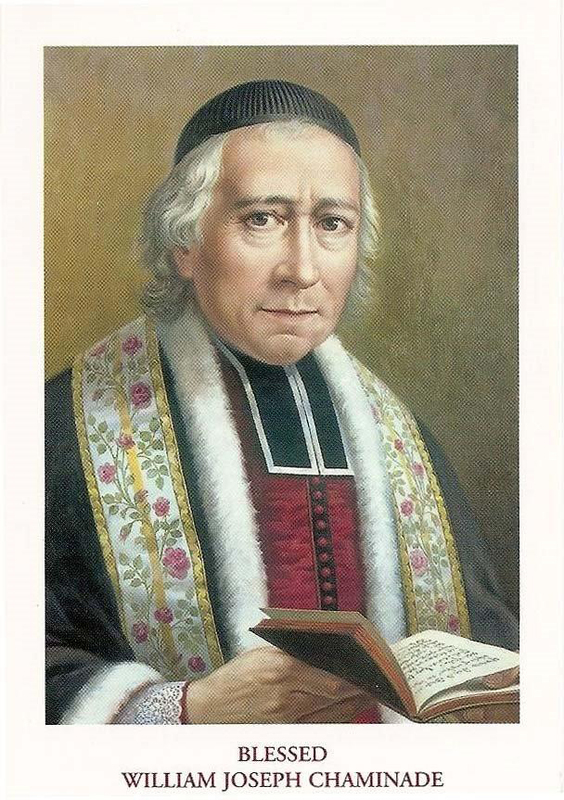 Born John James Morel before his entrance into religion, he was born near Friboug in Switzerland in 1739, and received his education from the Jesuits. In 1762 he joined the Capuchins in Zug and before long became a prominent preacher, a much-sought confessor, and an eminent instructor of the young clerics of the order. He impressed on their minds the truth that piety and learning are the two eyes of a priest, and humility was a dominating virtue in his life. He suffered a cruel martyrdom on September 2, 1792. Severin Girault, a member of the Third Order Regular, was a chaplain for a group of sisters in Paris. Imprisoned with the others, he was the first to die in the slaughter at the convent, a priest of the Third Order Regular, formerly George Girault, his undaunted courage merited the grace to be numbered among these martyrs of Christ. He was born at Rouen in Normandy, and early in life joined the Third Order Regular of St. Francis. Because of his eminent mental gifts he was chosen a superior of his order. In the exercise of his priestly duties he displayed marked zeal for souls, and as chaplain of the convent of St. Elizabeth in Paris he was a prudent director in the ways of religious perfection. He was also summoned to take the civil oath, and upon his refusal to do this he was seized and confined in the Carmelite convent where so many other confessors of Christ were being detained. 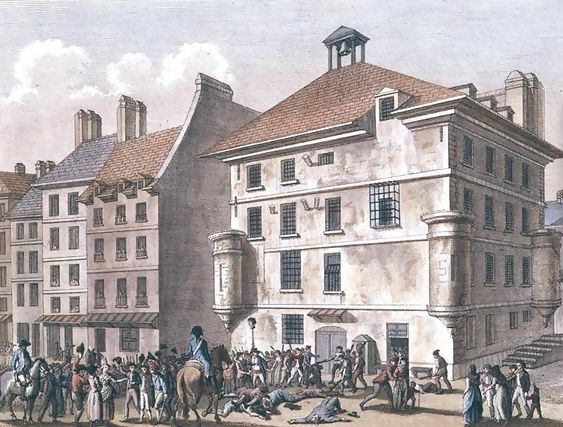 On September 2, while he was saying his Office in the convent garden, the raving assassins made him the first victim of their cruel slaughter. These three members of the Franciscan Order, together with 182 other servants of God who suffered martyrdom at this time, were solemnly beatified by Pope Pius XI, and the Franciscan Order was granted permission to celebrate their feast annually with an Office and special Mass. 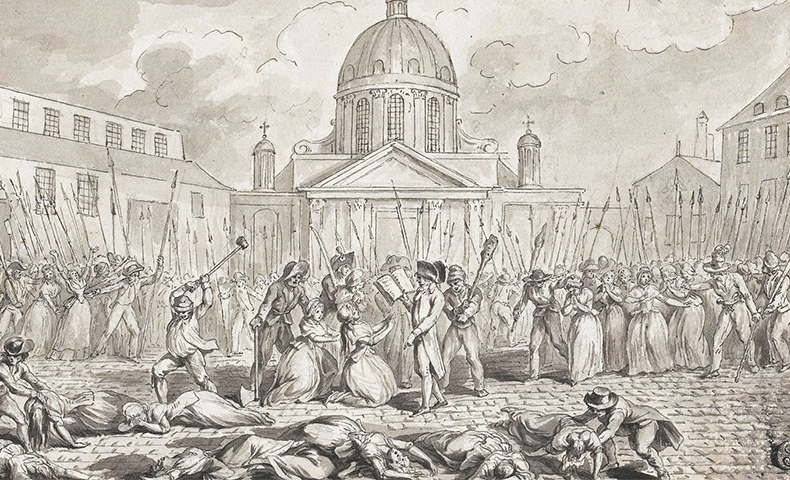 These three plus 182 others—including several bishops and many religious and diocesan priests—were massacred at the Carmelite house in Paris on September 2, 1792. They were beatified in 1926.John Baptist Triquerie, born in 1737, entered the Conventual Franciscans. He was chaplain and confessor of Poor Clare monasteries in three cities before he was arrested for refusing to take the oath. 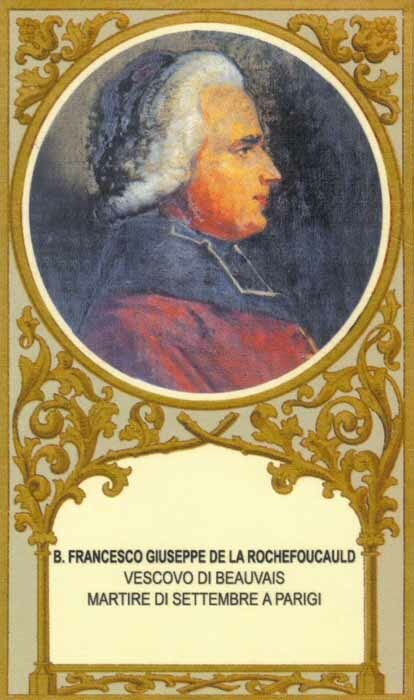 He and 13 diocesan priests were guillotined in Laval on January 21, 1794. He was beatified in 1955. “Liberty, Equality, Fraternity” was the motto of the French Revolution. If individuals have “inalienable rights,” as the Declaration of Independence states, these must come not from the agreement of society (which can be very fragile/mutable/mercurial/fickle/ephemeral/illusory) but directly from God, which the Declaration also declares with certitude and religious conviction to be the case for the United States. At least we started out that way. “The upheaval which occurred in France toward the close of the 18th century wrought havoc in all things sacred and profane and vented its fury against the Church and her ministers. Unscrupulous men came to power who concealed their hatred for the Church under the deceptive guise of philosophy…. It seemed that the times of the early persecutions had returned. The Church, spotless bride of Christ, became resplendent with bright new crowns of martyrdom” (Acts of Martyrdom). The Benedictines and Carmelites in some places in the USA, and of course in England and France, liturgically remember the September Martyrs, also called the Paris Martyrs; you will also see the memorial listed as “Blessed John du Lau and companions” after the Archbishop of Arles, the highest ranking prelate among the 191 martyrs. The Benedictine nuns of Stanbrook Abbey are connected with the Carmelite nuns and retain some of the relics. Historians tells us that about 1500 clergy and religious were killed in 1792. And this act of martyrdom inspired the writing of Georeges Bernanos’s “Dialogues of the Carmelites” and the famous opera of Francis Poulenc, by the same name. Some of the 191 were killed in cold blood, others were asked a question and depending on how they answered determined if they lived or died. No mental reservation was kept when it came to following the wisdom of the Church or the wisdom of man. One observer noted that common among those put to death was that all faced death in a happy manner as one who would’ve gone to a wedding. Indeed, the wedding feast the martyrs were going to was the Wedding Feast of the Lamb (see the Book of Revelation). 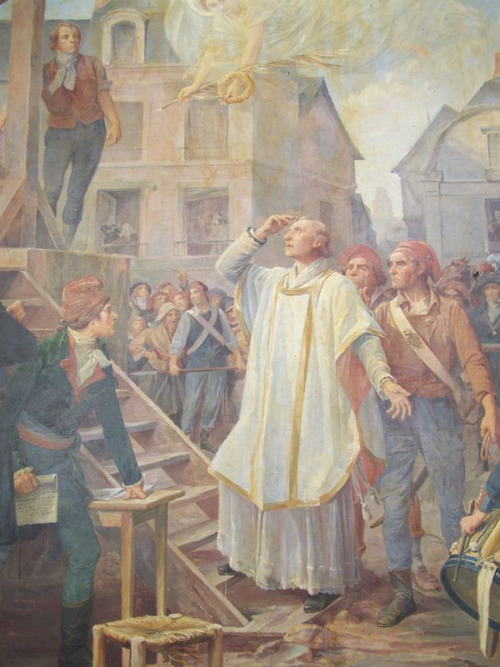 In 1790, the revolutionary government of France enacted a law denying Papal authority over the Church in France. The French clergy were required to swear an oath to uphold this law and submit to the Republic,the penalty for refusing to take the oath was deportation. Many priests and religious took the oath but a sizable minority opposed it. The revolutionary leaders’ primary target was the aristocracy, but by 1792, their attention turned to the Church, especially the non-jurors within it. In August, in the name of Liberty, Equality and Fraternity, those who had refused the oath were rounded up and imprisoned in Parisian monasteries, emptied for that purpose. 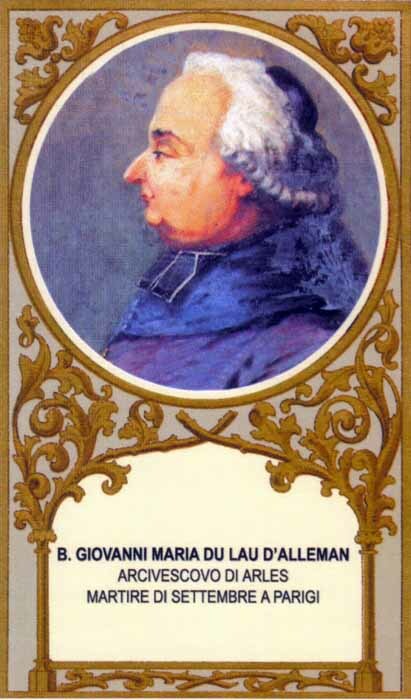 Blessed John du Lau, archbishop of Arles, was born on October 30, 1738 at the Château de la Côte at Biras in the Dordogne, in the diocese of Périgueux, of an aristocratic family which had fed many members into the higher ranks of the clergy. His father was Armand du Lau, seigneur de La Coste and his mother Françoise de Salleton. Refusing to take the oath to the civil constitution, he had been brought to Paris and cast into the prison of the Cannes, formerly a Carmelite monastery, awaiting deportation, as were the rest. 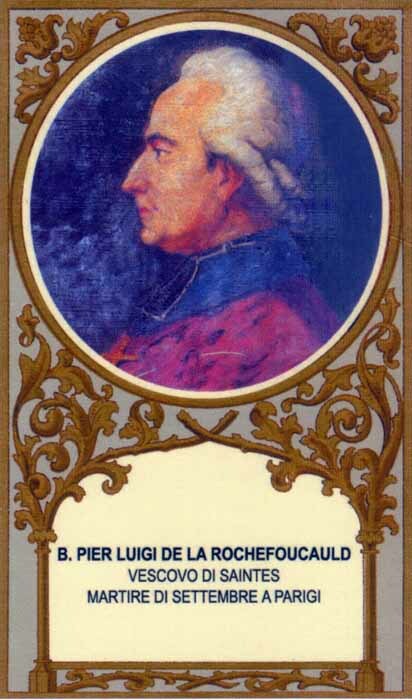 Blessed Pierre-Louis de la Rochefoucauld, Bishop of Saintes and a vigorous antagonist of Jansenism, and his brother, Francois-Joseph de la Rochefoucauld, Bishop of Beauvais, were sons of Jean de La Rochefoucauld, lord of Maumont, Magnac, and other places, knight of the military orders of Notre-Dame du Mont-Carmel and St-Lazarre de Jérusalem, and Marguerite des Escots. Both brothers were imprisoned. In September “Vigilance Committees” were set up and mobs sent to the make-shift prisons. On 2nd September a season of bloodshed and slaughter began. The inmates were cut-down in cold blood. All of the prisoners, even the old and disabled, were put to the sword. 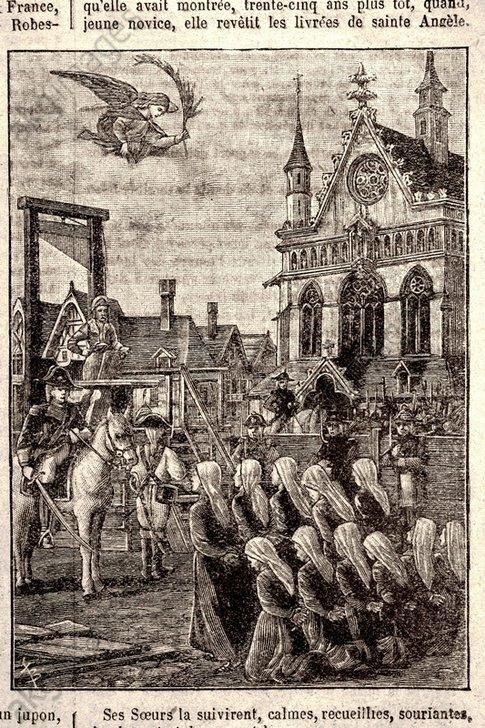 The executions at the old Carmelite monastery in Paris were recorded. Among the martyrs was Blessed Alexander Lenfant, a Jesuit. Just a few minutes before he died, he had been hearing the confession of a fellow priest. Both were killed moments later. The rioters then went to the Carmelite church which was also being used as a prison. The mob called out, “Archbishop of Arles!” Archbishop John du Lau of Arles (Jean-Marie du Lau d’Alleman) was praying in the chapel. When summoned, he came out and he said, “I am he whom you seek.” Thereupon, they cracked his skull, stabbed him and trampled him underfoot. Then the leader set up a “tribunal” before which the imprisoned were herded and commanded to take the oath. All refused; so, as they passed down the stairway, they were hacked to pieces by the murderers. The bishop of Beauvais had earlier been wounded in the leg. When summoned, he answered, “I do not refuse to die with the others, but I cannot walk. I beg you to have the kindness to carry me where you wish me to go.” For a moment, his courtesy silenced the assassins. But, when he, too, refused the oath, he was killed like the rest. All you Holy Martyrs of God, pray for us! Queen of Martyrs, pray for us!